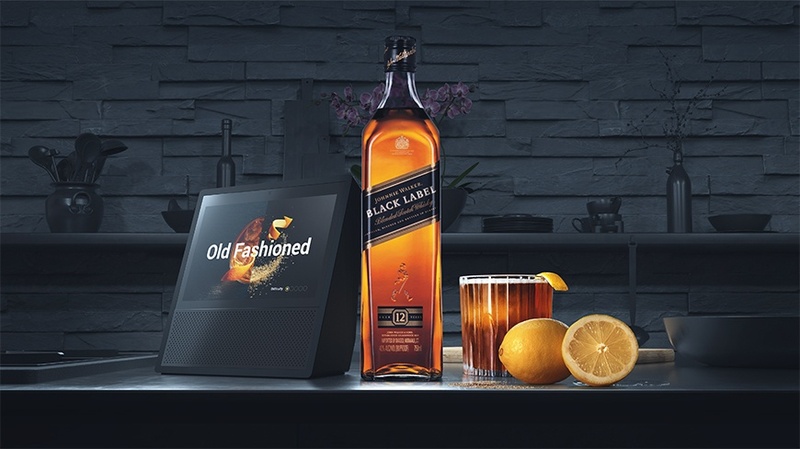 Following the release of Amazon’s Echo Show device, Diageo was quick off the mark to create a skill to help people mix cocktails at home. Shortly after Amazon’s Echo Show device (an Alexa voice assistant with a screen) went on sale towards the end of 2017, Diageo released a skill called The Bar, for people mixing cocktails at home. The age-restricted skill was created by Isobar, Amsterdam, and complements Diageo’s cocktail-mixing website, thebar.com. The Bar is controlled by voice commands, and operates through Amazon’s virtual assistant, Alexa. The skill offers three services: cocktail suggestions based on tastes, cocktail recipes, and instructions on how to master cocktail mixing techniques. The cocktail recipes and suggestions all promote Diageo brands, and users can also order ingredients and products through The Bar skill. To find out more about how and why Diageo created this voice skill, we spoke with Periklies Antoniou, Diageo’s new technology and media innovation manager, and Daniel Sytsma, founder and creative director at Studio Kraftwek Linked By Isobar. What was the brand challenge that pre-empted this campaign? Periklies Antoniou: The cocktail brief is consistent and it’s always on our minds. We know that within our industry, “at-home” consumption occasions tend to be driven by beer or wine. Cocktail making at home can be perceived to have its complexities. The Bar is a service that has been designed to inspire and enable consumers to try something new at home, with the ambition to help them become well-versed in the cocktail space. It was an extension of the Bar.com, which is a website with a plethora of cocktail content. That’s our inspiration platform, and it does really well on search because it has a rich portfolio of cocktails on there. The consistent theme is utility. Those challenges that we have around cocktail making – whether it’s [giving consumers] the tools, ingredients or how-to’s – that’s where we find things like the bar coming into play. They provide a value-add that allows us to cut through some of the pain points. How did you settle on Amazon Show as the interface? Periklies: When we first spoke, the conversation was: “we know the role of voice is going to increase when it comes to human behaviour and how people behave with brands; what role can Diageo play in this space?” Daniel Sytsma: It came off the back of an ongoing conversation about how to leverage voice. The moment we thought about this was the moment that Amazon’s Echo Show came out. It was the opportunity to build a case and start learning what it could do for consumers. What was the brief for this campaign? Periklies: In our briefing approach, we identified two key elements which we felt needed to be achieved in order for this to be a success. One: what is the business challenge we can crack? Two: can we create a great user experience to crack it? We’ve already discussed the answer to question one. Looking at the various business challenges, the one that stands out that we also felt was achievable through this technology, was cracking how we enable the cocktail consumption at home occasion. Secondly, as part of the brief we felt it was critical that the outcome was a great user experience, too. We know that with new interfaces such as voice, it is very important to get things right early, otherwise you can easily put people off using it again. Experience design is key, and repeat usage is a key KPI here, so we have made sure to prioritise learning about the human to machine interaction and optimise the experience with our learnings over time. We’ve launched the skill to learn what role Diageo can play in the home environment with a conversational experience. We specifically looked for qualitative results: Do users appreciate this service? Do they understand how it works? Are they willing to order ingredients and tools through Alexa? And can we create a routine with gamification elements? Even though The Bar works through Amazon’s Alexa assistant, did you have discussions about what Diageo would sound like, if it had its own voice? Daniel: It is possible, conceptually, to create a custom voice, but it means that you’re limiting yourself to whatever you record at that moment. Since we are using a test-and-learn approach, we wanted the flexibility to keep adding lines and content to this without having to go into the studio each time. Did you conduct any research while creating the Alexa skill? If so, what kind did you do and what results did it reveal? Daniel: We performed several user tests during development of the skill to determine how we can help users in the best way. One insight we got was that people have pretty high expectations from a voice interface so an old-school linear flow is not sufficient. That’s why we keep ‘listening’ to what users are asking and improve the answers based on those insights. What feedback or data are you able to amass through listening? Periklies: With every cocktail there’s a step-by-step guide and ingredients list. We can see people’s preferences and that’s really good insight for us: what works and what doesn’t. There’s five-to-seven steps for each cocktail, and that’s a dwell time of six or seven minutes. The completion rate, how far they’re getting: that’s the kind of thing we get in the back end. As we grow the skill and we bake in other elements then we’ll be unpacking a lot more information. And the information will be used for one reason – to find out how we iterate the experience and make it better each time around. What was the toughest part of creating the skill? Daniel: It’s a different interaction and we’re used to creating more visual interactions. When designing a voice skill you need to get even more so to the point, because every word is another couple of seconds added to the experience. And if the experience is really dragging then you’ve lost your user. Periklies: We’ve seen impressive numbers on flow completion, commerce conversion and retention, so we’re excited to scale up and drive this forward. Things we’re really happy with are the completion rate and the amount of ingredients being added to basket. The ingredients come at a good time in the flow and we’ve seen a good intention to purchase through the results. You see that people go away, get the ingredients and then come back and complete the flow of that cocktail. I’m not saying we’ve nailed it – there are some things that we need to refine – but we’re learning and we’re happy with those two key KPIs. Voice is flattening the purchase funnel... where is that exploration phase? What’s the wider significance of voice for a brand like Diageo? Periklies: If you’re looking in reverse at how commerce has evolved, then you can quite quickly identify that [at the beginning] you’ve got the in-store, off-trade ecosystem, where there are a bunch of products on a shelf, and that’s a marketplace that your brand needs to stand out in. It’s a mix of what you see there and what you’ve been exposed to in the run up to your visit. When that moved into ecommerce and the screen interface, what you found was that the marketplace still existed (in that there’s multiple brands to choose from on one page). Voice is different. Other than the Amazon Show, which has a screen, the majority of voice devices don’t have that functionality and therefore if you’re going to buy two bottles of Johnnie Walker Black Label that action’s just going to go straight through to your device, so that in essence voice is flattening the purchase funnel, because where is that exploration phase? What that means is that the work we do in our wider marketing comms has to work a bit better. It’s really interesting to see how brands make sure they show up in this space. I think for me, the most important thing is doing stuff like what we’re doing: marketing as a service. What other technologies are you telling your colleagues at Diageo they need to understand? Periklies: Advanced analytics, cognitive computing, chatbot activity and interfaces, which we’ve done some work in. And that’s not dismissing AR/VR and where we’re going with mixed reality. We’re testing AR menus at the moment. Then there’s more hygiene stuff like mobile marketing and those elements. But – and I know they’re buzzwords – the big two are AI and blockchain.